The opening day of the 2018 Australian Track National Championships saw Matthew Glaetzer delight the crowd taking more than two tenths of a second off his sea level record in the time trial. In team events South Australian dominated the team sprints taking gold in the men's with Glaetzer, Patrick Constable and Thomas Clarke and in the women's with Rikki Belder, Stephanie Morton and Holly Takos. Victoria won their first men's team pursuit crown in 10 years lead by world champion Kelland O'Brien, Leigh Howard along with Godfrey Slattery and Riley Hart along with Isaac Buckell in qualifying to go under four minutes in hotly contested final. Former world champion and world record holder Annette Edmondson joined forces with Alex Manly, Maeve Plouffe and Breanna Hargrave to claim the third gold in a row for South Australia. The star of the under 19's was Alex Martin-Wallace who stormed to gold in the final event of the night the under 19 women's scratch race, having also claimed silver in the elite team pursuit and under 19 team sprint. In a scorching time Matthew Glaetzer stopped the clock in 59.759 seconds to smash his own sea level record of 59.970 set in November on route to his second gold in the event having also won in 2014. Glaetzer bolted out of the block building over the opening two laps before digging in and holding on for dear life on the final lap. His time one of the top 20 fastest times in history, and one of only two (both held by Glaetzer) not at altitude reinforced his status as the rider to beat at the Commonwealth Games. Patrick Constable earned silver in 1min 1.812secs marginally faster than former junior world championship medallist Cameron Scott in 1min 1.820secs. World champion Kelland O'Brien along with Leigh Howard, Godfrey Slattery and Riley Hart along with Isaac Buckell in qualifying produced a stunning display to claim the first elite men's team pursuit national title for Victoria in 10 years. The quartet stopped the clock in 3mins 58.696secs to narrowly edged out the South Australia’s world champions Alex Porter and Rohan Wight who combined with young guns Jarrad Drizners and Braden O'Shea for 3mins 58.977secs. Bronze went to Ryan Cavanagh, Daniel Fitter, Jake Van der Vliet and Kaden Groves of Queensland in 4mins 13.365secs. In the elite women's it was South Australia who claimed their third title in a row lead home by former world champion and world record holder Annette Edmondson with Alex Manly, Maeve Plouffe and Breanna Hargrave who caught hometown favourites Kristina Clonan, Katrin Garfoot, Alex Martin-Wallace and Laurelea Moss in the closing laps. Dual team pursuit world champion Ashlee Ankudinoff joined with Josie Talbot, Nicola Macdonald and Angela Smith to take bronze. The under 19 women's crown went to Victoria's Alice Culling, Jemma Eastwood, Ashlee Jones and Sarah Gigante who claimed her fourth Australian title of 2018, having swept the criterium, road race and time trial at the Road National Championships in January. Silver went to Tess Wallace Claudia Jackson, Shari Heffernan and Emily Watts of New South Wales. Graeme Frislie, Jensen Plowright, Luke Plapp and Bill Simpson made it a Victorian double as they emerged on top in the under 19 men's in a time of 4mins 6.898secs. The podium was completed by Blake Quick, Elliot Schultz, James Moriarty and Ethan Viviers (Queensland-4:08.818) in silver and Thomas Lynch, Daniel Gandy, Rohan Haydon-Smith and Kurt Eather (New South Wales-4:11.760). It was a golden double for South Australia in the team sprints as they took out the elite men's and women's crowns. Stephanie Morton and Rikki Belder made it seven in a row for South Australia, as they stopped the clock in 33.462 seconds, with Holly Takos riding in place of Morton in qualifying. Three-time world champion Kaarle McCulloch and first year elite Selina Ho (New South Wales-35.602) grabbed silver with Caitlin Ward and former tandem world champion put themselves on the podium with bronze in a time of 34.955secs. 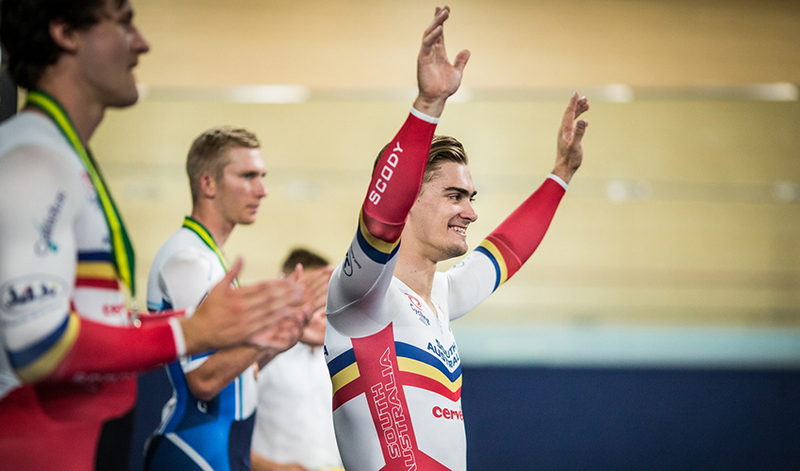 Having finished first, second and fourth in the kilo Matthew Glaetzer, Patrick Constable and Thomas Clarke powered home to gold in 44.035, overhauling an early advantage of team pursuit world champion Sam Welsford, Matt Richardson and Luke Zaccaria who took silver in 44.595. Bronze went to Victoria's Jacob Schmid, Conor Rowley and Braeden Dean in 44.646. 2017 Oceania Champion Brooklyn Vonderwall combined with Heather May to take out the under 19 women's title in 35.764 seconds for South Australia, beating out Queensland's Alex Martin Wallace who claimed medal two of the day and Emma Green in 36.833secs. Thomas Cornish, Zachary Marshall and John Trovas (New South Wales claimed the under 19 men's title in 46.329secs, just holding off South Australia's Carlos Carisimo, Leigh Hoffman and Cooper Tye in 46.572secs. Bronze went to Ned Polland, Sam Gallagher and Oliver Booth (Victoria-49.366). An amazing turn of speed by junior world championship bronze medallist Alex Martin-Wallace (Queensland) saw her easily close a near 50 metre gap at the start of the final lap to claim victory in front of a vocal home crowd. A late move by Wheeler with just under five laps to go nearly gave her the win with the bunch unwilling to chase as eyes looked to the favourite Martin-Wallace. Despite leaving it late there was no denying Wallace as she celebrated across the line ahead of Elizabeth Nuspan (Victoria) and Sophie Edwards (South Australia).